Department of Highway Safety | Car Couriers Inc. 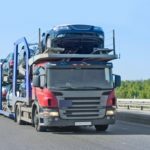 Vehicle transporters have to meet stringent DHS (Department of Highway Safety) and FHA (Federal Highway Administration) regulations. After all they haul up to 30 tons at a time, in addition to the curb weight of up to 20 tons. That is a lot of weight with what mostly private enterprises can put the general public. 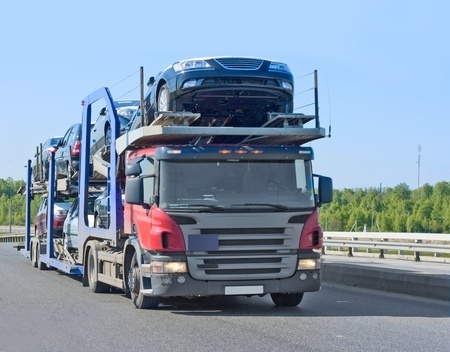 Depending on the size and cargo type shipped, there are anywhere between 200 and 1,000 points of inspection involved in passing a transport rig for inspection. The basic components to a regulated tie down system include the floors and walls, the decks, tie down anchors, headboards, bulkheads, stakes, posts and anchor points. Each of these must be in functioning order with very limited signs of wear. For both flatbed and multi-tiered auto rack transporters, the first points of inspection are the tie downs. These must not have any trace of damage or distress. These signs indicate weakened parts and sections. Another red mark against the equipment would be any knots, as these also result in compromised stress performance. Next in importance are walls and decks. If grates or floors are showing any sign of pitting or excessive wear, such as stress fractures, they are not considered suitable for use. These hold the weight of the cargo and if they are compromised in anyway, they cannot hold said cargo in place. The tie-down points and individual tie downs themselves are also crucial to a safely-functioning haul. Holding up to tens of tons in place and preventing any slippage or give, these are the last line of defense from falling off the trailer. If these are even remotely damaged, it doesn’t take much for these to crack, break and pull away, resulting in eminent disaster. Automobile transporters are well aware of the tremendous amount of weight they’re hauling. Fortunately, they are well trained to keep an eye on their rig and to detect any signs of wear present. Fortunately there are enforcing bodies regularly overseeing the standards they set while traversing America’s roadways.